Aw look, a cuddly widdle bunny wabbit with a blood-stained knife. And over there, a doe-eyed bear bursting into flames. Welcome to the world of Luke Chueh, an artist that has left us with warm, fuzzy feelings for the past few years with paintings that aren’t so warm and fuzzy. In fact, they’re all downright twisted, just. like. you. Lucky for us, he’s got some new works in store at his upcoming show, From Light Cometh Darkness. I’m almost positive it’ll be chock full of blood, guts, and vomit; all with an underlying social message of course. 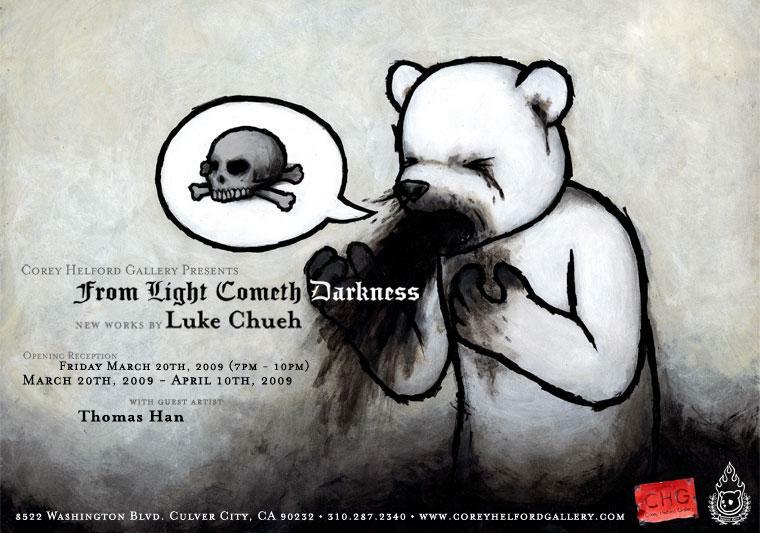 So be sure to stop by the Corey Helford Gallery in Culver City this Friday to join in on all the violent fun. And don’t forget to bring the kids.